Well, maybe CNN was a trendsetter all along with its anchor desk from Office Max? The trend has caught on at WNYW-TV, the Fox O&O in New York City. 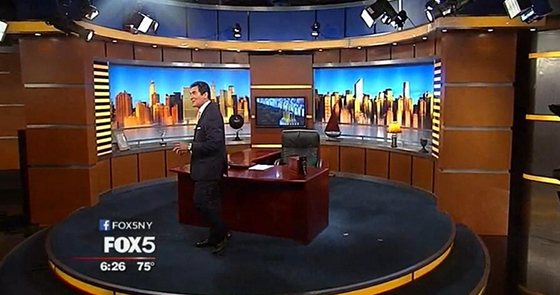 The station’s revamped 6 p.m. show with Ernie Anastos makes use of a large wooden office desk that looks like it came right off the showroom floor of your neighborhood office supply store. Along with not matching the Fox look, the desk would look better in a lawyer’s office. WNYW-TV placed the desk in the interview portion of the set, adding in some small tchotchkes around it. The station’s main anchor area could use a makeover; it’s been on the air since 2006.